but there are just white shards on this beach. Our love colours have dissolved into a chalky finish. I now collect you in other men. Eleni’s first collection, A butterfly's tremblings in the digital age (which is written in Slovakian), was published in 2013, after she won a national poetry competition in her native country Slovakia. Eleni’s English language poems were published in two pamphlets -Colours of the Swan and Autumn Dedications-, and featured in MK Calling 2013 & 2015, anthologies (e.g., Mother’s Milk); poetry magazines (e.g., Allegro) and as the ‘best poetry videos on the web’ (Moving Poems). Eleni is currently Poet in Residence at the Westbury Arts Centre. 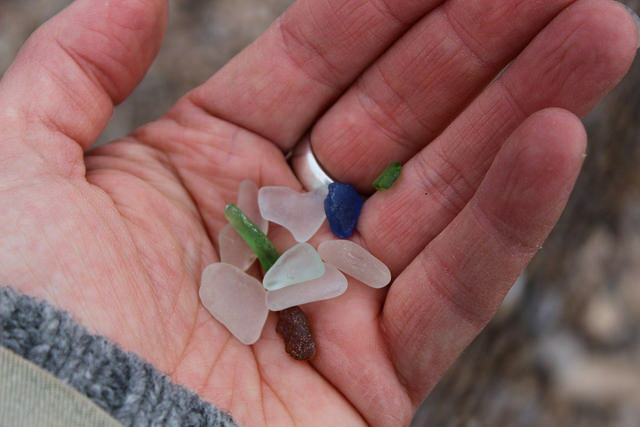 Image "Hunting for Seaglass" by Heather.